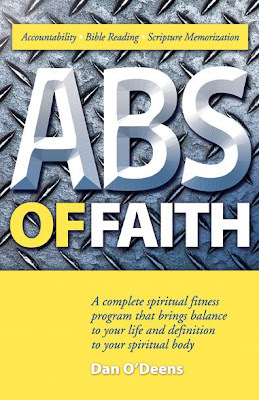 ABS of Faith, a new 161-page paperback book by Grace Brethren pastor Dan O’Deens, has just been released by BMH Books of Winona Lake, Indiana, and is now ready for shipping. Subtitled “Undergirded by Prayer, Helping Believers Gain Spiritual Muscle,” the book is a complete spiritual fitness program that brings balance to the life and definition to the spiritual body. ABS stands for Accountability, Bible reading, and Scripture memorization–three main aspects of the spiritual disciplines needed for believers to grow in their faith. The book is in two main divisions–“The Process” and “The Basics”–followed by a resource-rich section of exercises, Bible-reading charts, and templates for spending time with God. O’Deens is founder and lead pastor of Gateway Church, an innovative church in Parkesburg, Pennsylvania, a suburb of Philadelphia. Beginning in 1984, Dan has served as children and youth pastor and Christian school administrator. In 1996 Pastor Dan and Gay and their four children moved to Coatesville, Penna., to start Gateway Church. In September of 1997 Gateway Church launched its first public worship service. The book is available wherever Christian books are sold, or from BMH by calling (toll-free) 1-800-348-2756 or logging onto www.bmhbooks.com. The retail price is $12.99 and the ISBN number is 9780884693109. A website designed to accompany the book may be found at www.absoffaith.com.